We’d love your help. Let us know what’s wrong with this preview of What Ukulele Players Really Want To Know by Barry Maz. The bestselling beginners guide and handbook for the ukulele aimed specifically at new players or those thinking of taking up the uke. Many ukulele guides available are far too prescriptive and quite simply don't provide the answers to the common questions a beginner has. Whilst they concentrate on useful technique and provide sample songs to play, in my experience they le The bestselling beginners guide and handbook for the ukulele aimed specifically at new players or those thinking of taking up the uke. Many ukulele guides available are far too prescriptive and quite simply don't provide the answers to the common questions a beginner has. Whilst they concentrate on useful technique and provide sample songs to play, in my experience they leave the new player with a lot of questions unanswered. This book aims to fill in those gaps. It's not a tutor book, it's a book to answer all the other stuff! 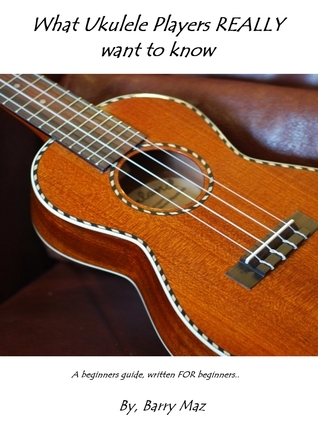 Barry Maz, ukulele player and author of the Got A Ukulele website has collated and expanded on his popular beginners guides to provide new players with a comprehensive resource of advice, tips and tricks for the ukulele. With 29 detailed sections dealing with everything from the shape and size of the instrument, to strings and even how to grow your fingernails and toughen fingers, the book provides no-nonsense advice from a seasoned ukulele player, written in a friendly style. The book draws on Barry's own experiences in starting out with the ukulele, and the mistakes he made so you don't have to! Also included is a handy reference section and ukulele glossary to help with those terms that may not be so familiar to the beginner. Barry advises that his book is best read in conjunction with other tuition methods or in advance of purchasing your first instrument, to bring a spot of welcome light relief to your practice and development with the uke. Think of it as a uke owners guide! Includes an interactive Table Of Contents. Happy strumming! ALSO NOW AVAILABLE - CHECK OUT 'More Of What Ukulele Players Really Want To Know' Barry's follow up book! NOW AVAILABLE - Chords That Ukulele Players Really Want To Know. To ask other readers questions about What Ukulele Players Really Want To Know, please sign up. One of those little books written by somebody who clearly knows their stuff and cares not to make it commercial. I learned tons from this guide. I'd already been playing and progressing well for 12 months, but this book opened my eyes, explained some issues i was having and is making me think about buying more ukes! Didn't teach me more about playing, but that isn't what this book is. It's like a bible for those " why is" or "what about" questions. Can I give it one star because I can't afford mor One of those little books written by somebody who clearly knows their stuff and cares not to make it commercial. Can I give it one star because I can't afford more ukes?? Lol!